When it comes to greenhouse gases, carbon dioxide tends to steal the spotlight — but new research in the journal Proceedings of the National Academy of Sciences (PNAS) reveals how scientists have developed a new, predictive tool to estimate nitrous oxide (N2O) emissions from rivers and streams around the world. N2O, a greenhouse gas with 300 times the warming potential of carbon dioxide, persists for over a century in the Earth’s atmosphere and is known to cause significant damage to the Earth’s ozone layer. Rivers and streams can be sources of N2O because they are hotspots for denitrification, a process whereby microbes convert dissolved nitrogen into nitrogenous gas. While previous research has attempted to quantify where and when N2O is emitted, rivers and streams have posed a significant challenge because accurately measuring N2O from flowing waters is difficult, particularly at the scale of an entire river system. The current study presents a widely applicable predictive model from which to estimate N2O emissions from waterways based on simple metrics including stream size, land use and land cover of adjacent landscape, biome type and varying climatic conditions. 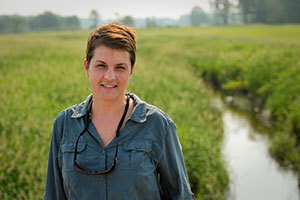 Working with an international team of scientists, Tank and her graduate student Martha Dee analyzed previously published emissions data from streams and rivers around the world including Michigan’s Kalamazoo River, New York’s Hudson River, the Swale-Ouse River in the United Kingdom and six large rivers across Africa. In addition, the team collected its own measurements of N2O from two river networks regionally, including the Manistee River in Michigan and the Tippecanoe River in Indiana. The researchers’ analysis of the combined dataset found that N2O emissions are dependent on river size — as it increases, the production of N2O shifts from the streambed to the overlying water. The new model will be a valuable tool for scientists and water managers alike, as the framework allows for accurate prediction of N2O emissions under a variety of scenarios including water temperature, changes in land use and the influence of climate change on emission outcomes. Co-authors of the study include Alessandra Marzadri and Daniele Tonina at the Center for Ecohydraulics Research at the University of Idaho, and Alberto Bellin in the Department of Civil, Environmental and Mechanical Engineering at the University of Trento in Italy. Research was funded through a collaborative grant from the National Science Foundation Hydrologic Sciences Program. Originally published by Jessica Sieff at news.nd.edu on April 11, 2017.